The Webster Preserve, purchased from the Webster Family in 2003, is a 30 acre wooded site located on Box Mountain above Valley Falls Park and the Hop River Rail Trail. Trails lead to an overlook of the Railroad Brook Valley, rock outcroppings and vernal pools. The Shenipsit Trail also passes through the property along the cliffs. To reach the preserve you'll have to climb a fairly steep path to the top of the cliffs. Maps: On NCLT's website is a description of all their Valley Falls Area properties with property and trail maps. Go to maps. Guided Hikes: NCLT usually leads a hike in the fall when the foliage is near its peak. Check hike and walk schedule on their website. The Preserve is located just west of Valley Falls Park (300 Valley Falls Road) and south of Valley Falls Road. Park in the Valley Falls Park lot. Access the Preserve either from Valley Falls Road or by following the Valley Falls Trail around the west side of the pond and then up the hill. Either route you will be climbing to the Hop River Trail. See map. 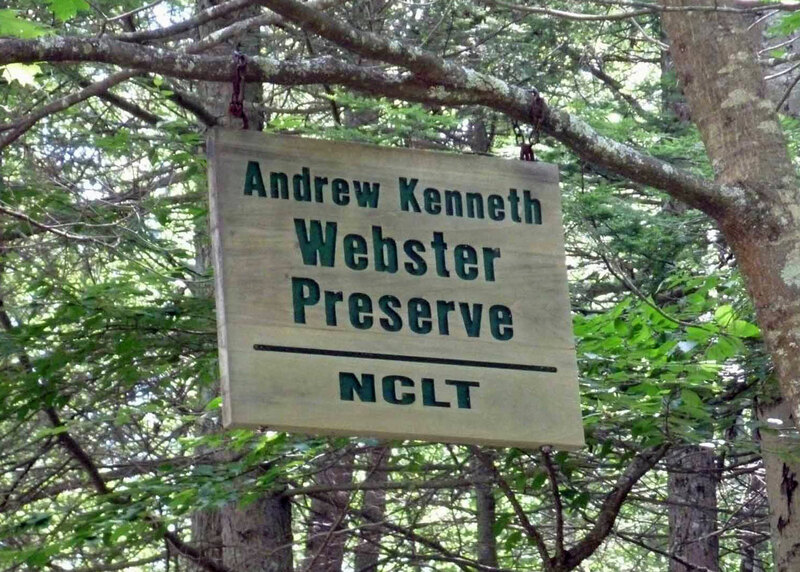 The Webster Preserve is owned by the Northern Connecticut Land Trust (NCLT). This is one of 7 properties they own in Vernon, 6 of which are in the Tankerhoosen Valley. The Northern Connecticut Land Trust is a private, non-profit 501(c)(3) organization staffed completely by volunteers to protect and promote open space and natural resources in the Vernon, Ellington, East Windsor, Enfield, Somers, and Stafford area. They rely on membership contributions and gifts for operating expenses, and through gifts, grants, and fund raising have acquired properties totaling over 1500 acres since our inception in 1987 (started out as Vernon Land Trust), several of which are working farms which are leased for farm use. » Learn more about NCLT and its Tankerhoosen Valley properties. View From The Cliffs: There is nice view from the top of the cliffs overlooking the Hop River Rail Trail and the Railroad Brook Valley. But be careful and stay on the path. Footing is tricky near the ledge. 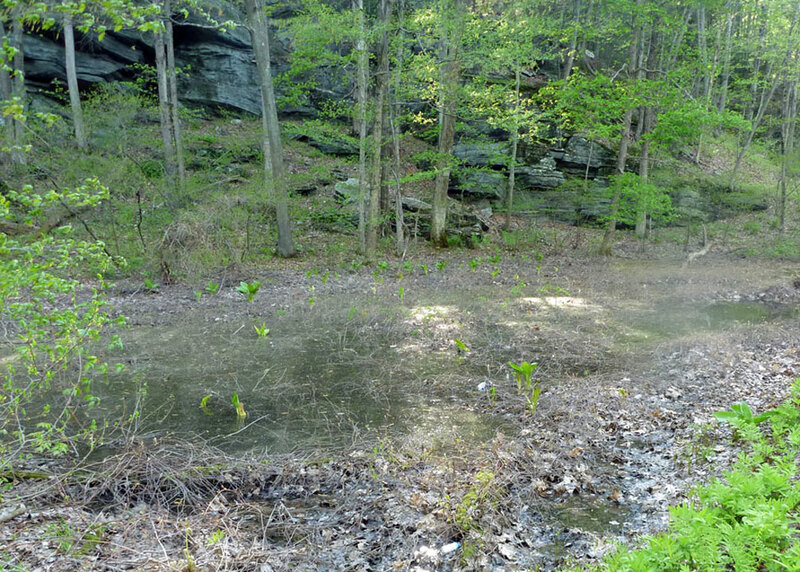 Vernal Pools: There are three vernal pools on the property, two at the top of the ridge and one adjacent to Valley Falls Road. This is the only vernal pool in the Tankerhoosen Valley that can be easily observed as it changes through the seasons. It is particularly picturesque as there is a cliff directly behind it. Fall foliage from the overlook. Hiking up Box Mountain. Valley Falls Road vernal pool.